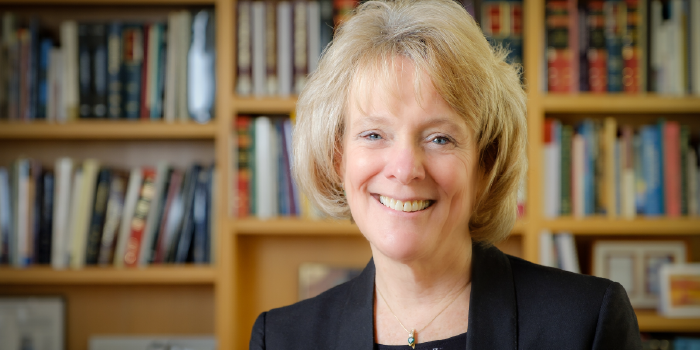 Executive Associate Dean for Academic Affairs Suzanne Reynolds quoted in Slate article on Gay Marriage in N.C.
Suzanne Reynolds (JD ’77) announced today that she will step down as Dean of the Wake Forest University School of Law at the end of the next academic year, effective June 30, 2019. Reynolds, who joined the Wake Forest law faculty in 1981, will return to the law school faculty on July 1, 2019, at the completion of her fifth year leading the school. She served as interim dean for a year before being appointed dean on July 1, 2015. Widely respected for her scholarship, teaching and public service, Reynolds served as executive associate dean for academic affairs from 2010 to 2014. She is the first woman to lead the law school. The 2019 U.S. News & World Report rankings recognized the law school as No. 32 in the nation, its second highest position ever and third rise in the past three years. The latest rankings also recognized the legal writing program as No. 12 in the country. In addition, Wake Forest graduates earned the highest North Carolina bar passage rate in 2017 and an even higher rate among all states where numbers of its graduates sat for the bar. Reynolds has worked tirelessly to “bring law to the world” by moving the law school’s Master of Studies in Law (MSL) degree wholly online and adding four online-only graduate certificate programs as well as increasing the number of online JD courses. Along that vein, she also has been a leader in the movement to allow U.S. law schools to accept the GRE in lieu of the LSAT in order to attract a more educationally diverse student body. In fact, Wake Forest law school is among the early adopters for GRE acceptance. During Reynolds’ tenure as dean, Wake Forest won an historic National Trial Team Competition sponsored by the Texas Young Lawyers Association (TYLA) with its two teams competing against each other in the final round. This championship was Wake Forest’s first in the National Trial Team Competition. The win also makes Wake Forest the only U.S. law school to win the national TYLA competition, the national American Association for Justice (AAJ) Student Trial Advocacy Competition and the National Moot Court Competition in consecutive years. Only one other law school has won all three titles in the history of all three competitions. Reynolds has been instrumental in reconnecting law school alumni with the University. She has helped raise more than $1 million for the Law Fund last year for the first time, and is on pace to raise even more this year. She has also helped secure more than $15 million in gifts and pledges for student scholarships and financial aid, faculty and programmatic support ​ and the Worrell Professional Center. Executive Associate Dean for Academic Affairs Jonathan Cardi and Associate Dean for Administrative and Student Services Ann Gibbs, along with Associate Deans Chris Knott, Gregory Parks, Alan Palmiter, Simone Rose and Richard Schneider, will continue to work with Reynolds in leading the School of Law in the coming year. Known nationally for her expertise in family law, Reynolds was a principal drafter of statutes that modernized the laws regarding alimony, equitable distribution, and adoption. She authored a three-volume treatise on North Carolina family law that has become the authoritative source for law students, lawyers and judges. She will continue to work on a new edition of this work that has helped shape family law in North Carolina. A search advisory committee will soon be named to begin the process of choosing a successor as Dean of the School of Law.